"pointed out that currently there are two families of atmospheric models with quite different formulations of model physics, one represented by the general circulation models (GCMs) and the other by the cloud-resolving models (CRMs). Ideally, these two families of models should be unified so that a continuous transition of model physics from one kind to the other takes place as the resolution changes." In other words, "quite different model physics" of convection are used in high-resolution models to simulate clouds vs. the over-simplified physics of convection utilized by low-resolution global general circulation models (GCMs). The IPCC uses GCMs to create its global warming projections, and thus it is not reassuring that the primary heat transfer mechanism in the troposphere - convection - is oversimplified in these models [and thus incorrect]. Like physicists trying to devise a "grand theory of unification" between the particle and macro worlds, this paper suggests some early steps to unify the "quite different model physics" of low-resolution GCM models and high-resolution cloud-resolving models [the latter with the more accurate physics]. Prior papers have demonstrated that GCMs models are unable to simulate conventional turbulent [convective] heat flow and thereby violate the 2nd law of thermodynamics, and that IPCC global climate models do not realistically simulate convection. Convection is the most important cooling and heat transfer mechanism in the troposphere and overwhelms or "short-circuits" so-called radiative forcing. These three papers collectively demonstrate a current inability of GCMs to properly simulate convection and thus cooling and heat transfer in the troposphere. Therefore, unless or until these problems are resolved, the IPCC global climate models cannot provide realistic projections of future warming or cooling. 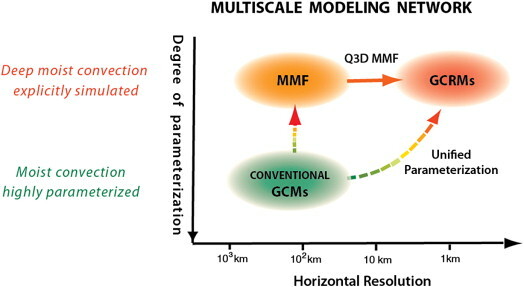 Multiscale modeling of the moist-convective atmosphere is reviewed with an emphasis on the recently proposed approaches of unified parameterization and Quasi-3D (Q3D) Multiscale Modeling Framework (MMF). The cumulus parameterization problem, which was introduced to represent the multiscale effects of moist convection, has been one of the central issues in atmospheric modeling. After a review of the history of cumulus parameterization, it is pointed out that currently there are two families of atmospheric models with quite different formulations of model physics, one represented by the general circulation models (GCMs) and the other by the cloud-resolving models (CRMs). Ideally, these two families of models should be unified so that a continuous transition of model physics from one kind to the other takes place as the resolution changes. This paper discusses two possible routes to achieve the unification. ROUTE I unifies the cumulus parameterization in conventional GCMs and the cloud microphysics parameterization in CRMs. A key to construct such a unified parameterization is to reformulate the vertical eddy transport due to subgrid-scale moist convection in such a way that it vanishes when the resolution is sufficiently high. A preliminary design of the unified parameterization is presented with supporting evidence for its validity. ROUTE II for the unification follows the MMF approach based on a coupled GCM/CRM, originally known as the “super-parameterization”. The Q3D MMF is an attempt to broaden the applicability of the super-parameterization without necessarily using a fully three-dimensional CRM. This is accomplished using a network of cloud-resolving grids with gaps. The basic Q3D algorithm and highlights of preliminary results are reviewed. It is suggested that the hierarchy of future global models should form a “Multiscale Modeling Network (MMN)”, which combines these two routes. With this network, the horizontal resolution of the dynamics core and that of the physical processes can be individually and freely chosen without changing the formulation of model physics. Development of such a network will represent a new phase of the history of numerical modeling of the atmosphere that can be characterized by the keyword “unification”. The importance of multiscale modeling of moist-convective atmosphere was recognized in the early 1960s in tropical cyclone modeling when the idea of CISK was introduced. In CISK, cyclone-scale and moist-convective scale of motion cooperate with each other for simultaneous development in a conditionally unstable atmosphere. Although this idea became popular among the tropical meteorology community, its physical basis can be questioned. An alternative idea for multiscale modeling of moist-convective atmosphere is moist-convective adjustment of the conditionally unstable environment to a neutral state. This idea was introduced first in general circulation modeling also in the 1960s. If the adjustment takes place sufficiently fast compared to the destabilization of the environment by other processes, we expect that the atmosphere undergo a sequence of quasi-neutral states in which large-scale destabilization and moist-convective stabilization approximately balance. This leads to the concept of moist-convective quasi-equilibrium as reviewed in Section 2. It seems that many existing cumulus parameterizations use this kind of closure typically with a finite time scale for adjustment. To a large extent, the history of cumulus parameterization has been designing, revising, evaluating and tuning of closure assumptions, cloud models, and formulations of convective triggering. Practically all of these efforts are, however, based on the modular structure shown in Fig. 3, which can be justified only when there is a spectral gap both in space and time. It is pointed out that the history has reached the stage at which we should seriously question the impact of this artificial separation. Strictly speaking, truncation of a continuous system can be justified only when the resulting error can be made arbitrarily small by using a higher resolution. This requires that the dynamics and physics of the low-resolution models converge to those of the high-resolution models with an increase of the horizontal resolution. Unfortunately, this is not the case for the conventional formulations of model physics in GCMs because it is not based on a sufficiently general framework for representing the multiscale effects of moist-convective processes. If the model physics of GCMs is reformulated in such a way that it converges to that of CRMs, these two kinds of model physics are unified. Then, we can freely choose intermediate resolutions or highly heterogeneous resolutions such as in the local or adaptive mesh refinement while staying with the same formulation of model physics. This paper reviews two possible routes to achieve the unification. ROUTE I uses a new framework for cumulus parameterization in which the result of parameterization converges to an explicit simulation of cloud processes as the resolution increases. In this way the framework unifies parameterizations in GCMs and CRMs as far as the representation of deep moist convection is concerned. With the unified parameterization, the error of the GCM solution to satisfy the CRM equations can be made arbitrarily small by using a higher resolution. It is shown that a key to construct a unified parameterization is to eliminate the assumption of small fractional area covered by convective clouds, which is commonly assumed in the conventional cumulus parameterizations either explicitly or implicitly. A preliminary design of the unified parameterization is presented and partially evaluated, which demonstrates that such an assumption could be eliminated through a relatively minor modification of the existing mass-flux based parameterizations. It is also shown that the unified parameterization provides a physical and quantitative basis for the relaxed adjustment that gives a more room for explicit simulations of the transports. There are two main sources for uncertainty in the results of the unified parameterization: one is the non-deterministic nature of the closure and the other is estimating cloud properties with huge dimensions by a simple cloud model that has only limited degrees of freedom. This may suggest the necessity of including a stochastic component in the parameterization. It should be noted, however, that such a component is not needed for large values of σ because the explicit simulation by the CRM can act as a random-process generator by itself. In what way and to what extent we should include the stochastic component in the unified parameterization is one of the remaining questions. The unified parameterization has its own scientific merit because of its simple structure. When sufficient computer resources are available, however, we should rather pursue the other approach, ROUTE II, which follows the MMF approach to statistically couple GCM and CRM grids. The Quasi-3D (Q3D) MMF is an attempt to broaden the applicability of the prototype MMF without necessarily using a fully three-dimensional CRM. To overcome some of the limitations of the prototype MMF, such as the two-dimensionality and periodic boundary conditions of the embedded CRMs, the Q3D MMF introduces a horizontal domain that consists of two perpendicular sets of channels, each of which contains a locally 3D array of grid points. For computing efficiency, the widths of these channels are chosen to be narrow barely sufficient to accommodate active convective clouds of a typical size. Thus, when a relatively large grid size is used for the CRM component, the number of grid points in the lateral direction can be as small as two. The algorithm of the Q3D CRM is basically that of limited area modeling applied to a horizontal domain with gaps. However, due to the use of narrow channels, the design of the lateral boundary condition is much more demanding than usual limited-area modeling. An obvious necessary requirement is that the lateral boundary condition should not cause computational instability. In addition, it must not significantly distort the statistics of internal solutions. Among the various possibilities examined, it is found that the most effective way to satisfy these requirements is to use the periodic lateral boundary condition for the deviations of all variables from their background values given by interpolation of the GCM variables. A great advantage of the Q3D MMF is that, as in the unified parameterization, it converges to a 3D CRM as the GCM's resolution is refined while maintaining the same model physics. In the Q3D MMF, the model physics is the CRM physics throughout. An outline of the Q3D algorithm and highlights of preliminary results are reviewed. Comparing the simulation results with the corresponding benchmark simulation performed with a 3D CRM, it is concluded that the Q3D CRM can reproduce most of the important statistics of the 3D solutions, including precipitation rate and heat fluxes at the surface and vertical profiles of the vertical transports of major prognostic variables. Significant improvements compared to the corresponding 2D simulations appear especially in the surface fluxes and the vertical vorticity transports. In the solution of a coarse-resolution 3D CRM that has approximately the same number of grid points with that of the Q3D CRM, the low-level moist static energy and cloud water are over-predicted and the surface latent heat flux is under-predicted. This is probably due to the inefficient upward transport of moisture with the coarse-resolution. The Q3D algorithm is quite successful in simulating the case where clouds are well organized into a squall-line type. Idealized squall lines, which have a linear structure, are rather two-dimensional phenomena so that they can be more easily represented by the Q3D grid system if the system can recognize their orientation. Having two perpendicular sets of channels enables the CRM component to recognize the orientation reasonably well. It is less successful, however, for the case where small clouds are scattered and therefore cloud circulations are almost purely three-dimensional. It is not an easy task to successfully simulate the pure 3D case with a “gappy” grid system. To represent scattered clouds better in the Q3D MMF, a stochastic component may have to be included. In the tests performed, the Q3D CRM is not interactively coupled with the GCM component because the horizontal domain is very small so that the GCM cannot produce any physically meaningful horizontal inhomogeneity. For large-scale applications, however, the Q3D network should be coupled with a GCM grid. Coupling the dynamics of the two models is important, especially in view of the convergence of the Q3D MMF to a 3D CRM. In the Q3D MMF, the CRM grid extends beyond the GCM grid cell so that it can represent large-scale dynamics and, therefore, the CRM can generate its own large-sale forcing. To avoid “double counting” of large-scale dynamic processes, we are planning to choose a way in which the Q3D CRM is responsible only for calculating the mean nonlinear effects of the deviations (e.g., eddy transport terms) and most of the diabatic effects due to sub-grid processes. The netsize-averages of the CRM prognostic variables are adjusted to the GCM prognostic variables, loosely/tightly when the GCM resolution is low/high. It is mainly through this coupling that neighboring parallel channels can communicate with each other. The communication is generally statistical but becomes more local as the GCM grid size approaches the CRM grid size. The Q3D MMF and GCMs with the unified parameterization still represent different families of models although they converge to the same model, a GCRM, as the GCM resolution approaches the CRM resolution (see Fig. 28). We envision that the hierarchy of future global models should form a “Multiscale Modeling Network (MMN)”, which combines the above two routes as shown by the vertical dashed line in Fig. 28. With this network, the horizontal resolution of the dynamics core and that of the physical processes can be individually and freely chosen anywhere between those of the conventional GCMs and CRMs without changing the formulation of model physics. Multiscale modeling network that consists of the unified parameterization, the Q3D MMF, and a link between the two. Fig. 29 illustrates the history of numerical modeling of the atmosphere. The period of 1950s, which can be characterized by “Victory of Simplification”, began with the first successful numerical weather prediction (NWP) by Charney et al. (1950) using an equivalent-barotropic quasi-geostrophic model. The period from the 1960s through 2000s, which can be characterized by “Expansion of the Scope and Diversity”, began with the development of the early GCMs. A number of numerical models are subsequently developed for different scales. From the 2000s to present, there is a tendency toward “Unification” of these models. The approaches of MMF and MMN reviewed in this paper expand the unification all the way from GCMs to CRMs as shown by the red bracket in the figure. Illustration of the history of numerical modeling of the atmosphere.